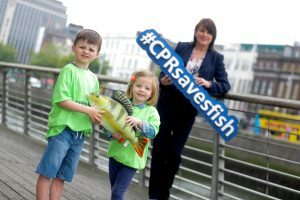 CPR saves fish according to Inland Fisheries Ireland at the launch of a new campaign to highlight angling and the importance of conservation. The hashtag #CPRsavesfish has been placed across a number of bridges and high footfall locations across the country to engage the public around the pursuit of conservation focused angling. ‘CPR’ stands for ‘Catch, Photo, Release’ and refers to a method of angling where a fish is caught and subsequently returned unharmed back into the water. This angling technique is proven to contribute to the maintenance of healthy fish stocks and ensures future generations can continue to enjoy the recreational and economic benefits of the fisheries resource. Inland Fisheries Ireland is supporting catch and release across all types of angling including pike, coarse, salmon and trout fishing as well as sea angling. The method results in positive survival rates for fish when caught using best practise methods. Research carried out by Inland Fisheries Ireland and the Norwegian Institute for Nature Research in 2014 examined the survival of salmon after catch & release fishing in three Irish rivers – the Owenmore in County Mayo, the Mulkear in County Limerick and the Feale in County Kerry. Overall, 92% of the Atlantic salmon recorded after tagging survived post Catch & Release*. The #CPRsavesfish stencils can be found in urban locations in each River Basin District in Ireland including Dublin, Cork, Galway, Limerick, Letterkenny and Kilkenny. The hashtag stencils, which have been power washed with water onto pavements, are completely environmentally friendly and are expected to fade naturally in the coming weeks. Suzanne Campion, Head of Business Development at Inland Fisheries Ireland said: “This awareness campaign aims to put angling on the general public’s radar by playing on the concept of CPR as a lifesaving mechanism and to engage existing anglers around the practise of catch and release fishing. Catch, Photo, Release (CPR) angling ensures the sustainability of our fisheries resource in the long term with most sporting anglers in Ireland already practicing catch and release to some degree, recognising that it ensures the maintenance of healthy fish stocks and the sustainability of the sport in the long term. There are currently 273,600 domestic anglers in Ireland with a further 163,000 international visitors who enjoy fishing here. Angling supports 11,000 jobs nationwide, often in rural and peripheral communities, and contributes €836 million to the Irish economy every year. For more information on Ireland’s fisheries resource, the method of Catch, Photo and Release angling and where to go to try out fishing, visit www.fishinginireland.info/cprsavesfish . Inland Fisheries Ireland is a statutory body operating under the aegis of the Department of Communications, Climate Action and Environment (DCCAE) and was established under the Fisheries Act on 1st July 2010. Its principal function is the protection and conservation of the inland fisheries resource. Inland Fisheries Ireland promotes, supports, facilitates and advises the Minister on the conservation, protection, management, development and improvement of inland fisheries, including sea angling. Inland Fisheries Ireland also develops policy and national strategies relating to inland fisheries and sea angling and advises the Minister on same.